Need A Free-Standing Hot Coffee Vending Machine for your Office? You are here: Home Need A Free-Standing Hot Coffee Vending Machine for your Office? Atlante 500 is the new and standard-setting generation of free-standing hot coffee vending machines for your business or office ... dispensing hot beverages - this coffee vending machine is stunningly impressive from every angle you look at. Its innovative U-profile design with soft and elegant lines adds style to every room. It will look good in your office. Along with its generous capacity (up to 550 cups for large sites and coffee drinkers), its superb choice of products (up to 39 different products) and supreme convenience thanks to the revolutionary Saeco rotating plate system this vending machine is a wonder and it is perfect also for medium locations. 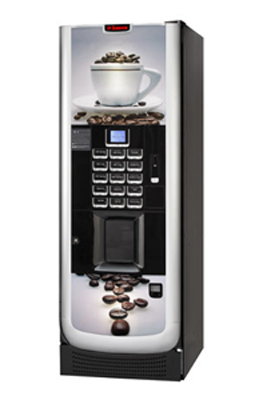 Atlante 500 creates a perfect coffee corner for any office requirement / setup, being either a stand-alone or combined Vending Machine with the the ability to also offer snacks & food, microwavable meals or even chocolate chip cookies or choc fudge brownies. Aliseo, also offers a complete solution I Coffee Vending. With the relative kit it can be transformed into a Master machine in association with an Aliseo Slave. Available in Espresso with double grinder, Espresso with one grinder and Instant versions.